Feminists do not want to eradicate men and male power, and bring about female supremacism. Unfortunately, the comments on the posting at your blog are closed. Therefore I will respond directly to you. It is not as important for you to wonder how the author (Suswati Basu) of the article at thefword.org found out about you having posed as Batman as it is to debunk her assertions of historical factoids that clearly come out of the rummage bag of feminist “herstory”, the re-writing of history as we once knew it, and that the IGAF is addressing exactly those sort of false assertions by feminist propagandists. Take just a few of the propagandist assertions by Suswati Basu. That lie is easily refuted, and that has already been done. Have you ever heard of the National Congress of Mothers? Until recently I didn’t know about them myself and I’ve spent a lot of time studying women’s organizations. It so happens that the NCM was actually the biggest women’s lobby in American history. Founded during the presidency of Theodore Roosevelt, it had 190,000 members by 1920 and over one million by 1930. The National Organization for Women, even in its heyday, could never claim such numbers. I learned about the National Congress of Mothers in a short but highly informative book, There’s No Place Like Work by Brian C. Robertson. It has a provocative sub-title: How Business, Government, and Our Obsession with Work Have Driven Parents From Home. The title pretty well tells you what the book is about, an account of how the workplace has replaced the home as the center of our lives. I found it particularly instructive because Robertson’s account challenges recently formed misperceptions about our gender political history since the founding of the nation. It is in that sense an effort to recover the American past. before women obtained the vote, and were voiceless ‘second-class’ citizens. Already under Ottilie Baader and Clara Zetkin, the most prominent fighters of the proletarian and later socialistic women’s movement, the original, all-encompassing concerns of the association were reduced to focus on the labour movement. The Leading principle expressed in the slogan “Woman and Worker have in common that they are oppressed,” identified the political liberation of the proletariat in connection with the political and labour-laws liberation of the woman — although what was meant by that weren’t all women in general, but merely women who were employed. The main goal of the efforts was the voting franchise for women. England became the fighting example to be emulated by the German women’s movement. German women noticed with angry pride the first arrests of women’s right activists in England in the last years of the 19th century. From 1903 on, under the leadership of Sylvia Prankhurst, the suffragettes became visibly more aggressive. An external sign was the war of the fashion over the substitution of the more clinging suffragette-silhouette for the traditional crinolines. Malicious cartoons of goat-faced, skinny women without bosoms and bottoms amused the male world and those women who were excluded from the women’s movement — namely the non-employed housewives. Still, remember what Hitler had said about effective propaganda. Never present the truth in academic fairness. Although Karin Jaeckel’s writing is largely pro-male and pro-family, even she is not totally immune to the damages caused by feminist propaganda. The reality of the voting franchise by the masses is that men did not have it much better than women did, once it came to voting. “One in every eight Englishmen had the vote in the early nineteenth century, a proportion that the Reform Bill of 1832 raised to one in five. That should help to dispel the myth that women did not have any power to influence in the early 20th century. Women’s organisations such as the Fawcett Society are campaigning on issues such as equal pay. In the UK, women get paid, on average, 16.4% less than men…. That is just as wrong and as easily debunked. For one thing, all developed nations now have very strong laws that make all attempts to pay women less for equal work done illegal, but let’s look at some of the truth about the lie that women are getting paid less. As with all feminist “research”, in this area, too, the truth is stranger than fiction. That the feminist fiction is being maintained as “the truth” is the strangest part of it all. The evidence that feminist researchers have not been telling the truth about the lack of pay equity for women has been around for decades. …all effective propaganda must be limited to a very few points and must harp on these in slogans until the last member of the public understands what you want him to understand by your slogan. And the placards held at this year’s Million Women Rise stated “End Male Violence against Women”. Yes, that is true, and even the placards held at this year’s Million Women Rise (at which considerably less than a million women rose) are true. There is violence against women. However, remember what Hitler had said about effective propaganda. One should never present the truth in academic fairness. That is exactly what the feminist propaganda about violence against women does. It does not present all of the truth and nothing but the truth. Most of all, it does not present the truth about violence against men, absolutely no truth at all. It does not even mention violence against men. SUMMARY: This bibliography examines 275 scholarly investigations: 214 empirical studies and 61 reviews and/or analyses, which demonstrate that women are as physically aggressive, or more aggressive, than men in their relationships with their spouses or male partners. The aggregate sample size in the reviewed studies exceeds 365,000. There is no doubt that more men than women die on account of violence, roughly two men for every woman, but the feminist assertion about violence against women implies that we have an epidemic of violence by men against women. That leaves the last wrong claim in Suswati Basu’s feminist polemic that caught my eye to be debunked. According to an IGAF member, the feminist message clearly implied here is “male slaughter, female supremacy”. There is absolutely nothing the feminists state that you can or must accept at face value. Nevertheless, what they say about you means virtually nothing compared to their objectives in their larger scheme of things. This entry was posted in Civil Rights, Feminism, Media Bias, Men and Women Work, Men's Issues, Propaganda Exposed, Social-Destruction Enterprise, The New World Order, Women's Violence. Bookmark the permalink. Law School, University of Chicago; John M. Olin Law & Economics Working paper No. 60 2nd Series. By Larry Kenny and John R. Lott, Jr.
Each data point in the progressions in the graph is separated from the next data point by one year. The exact years are not shown. That is because the graph represents the summary of the effects of the women’s voting franchise in all U.S. states, and the years in which that happened differed for many states and ranged over a large interval of years. 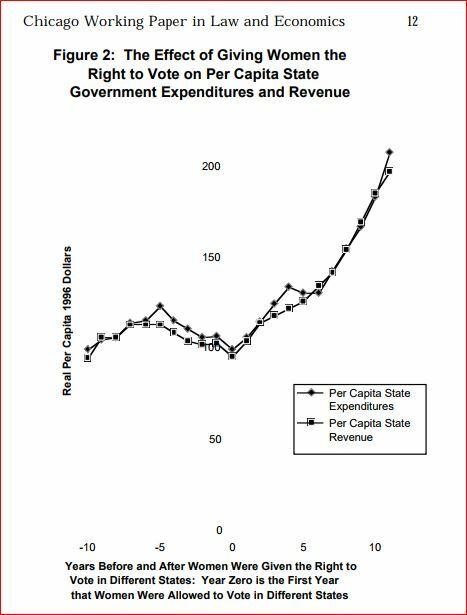 The study report (but not the summary shown in the above graph) shows the exact effects, by years, that apply for each state. In effect, what the information in the study report shows is that we have had, at least in the U.S., run-away, cancerous increases in government expenditures and tax collections ever since women got the right to vote. Now, is that not a good thing to know? You may want to file that study report and look it up now and then, every time a feminist spouts off about how good it was that women got the vote.